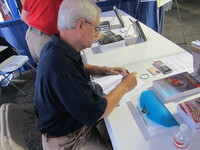 Randall Reneau is the author of seven novels, including Diamond Fields, a Royal Dragonfly Book Awards grand prize winner, and The Medinandi License, a Silver Falchion Award winner. He is also a two-time winner of the Pinnacle Book Achievement Award. A former international geologist and Vietnam veteran, he lives with his wife, Lynne, in Austin, Texas. To ask Randall Reneau questions, please sign up. Randall Reneau So far, haven't had to deal with that problem. Randall Reneau Letting the characters run ... it's amazing where they'll take you, if you give them the chance! The Paloma Crossing was named best fiction - 2018 by the Amelia Island Book Festival. Awards presented by NYTBS, Steve Berry. Lee Child was also on hand to meet with winners!
" I can't find the "Promo Folder" but want to make everyone aware of my Kindle Scout nomination page - for my new thriller: The Medinandi License (W. Af I can't find the "Promo Folder" but want to make everyone aware of my Kindle Scout nomination page - for my new thriller: The Medinandi License (W. African Thriller). If you like what you see, please nominate! If book is selected for publication by KS, all who nominated will receive a FREE e-book (The Medinandi License) from Kindle Scout! Thank you in advance . . . ...more "
A poignant love story between a young naval officer and his new bride; told through their correspondence during deployments. The author's excellent narrative ties all the parts together in a style reminiscent of "Letters from Iwo Jima!" We’d love your help. Let us know what’s wrong with this preview of Sister Santee by Ken Burger.